The idea of turning in your last final exam (or final final, if you will) probably seems like a heavenly prospect. We wouldn’t be surprised if this fantasy has played out in your dreams over and over. The bad news is that we’re not quite there yet, but the good news is that this seemingly intangible dream of being done will soon be a reality. We also have another piece of good news: the EnVision Apartments are here to help! Though we can’t help tutor you or study with you, we help University of Akron students by taking care of their living situation. We don’t just provide Akron apartments — our goal is to serve the local student population with a comfortable, safe, and convenient place to call home (even when you’re far away from home). Free from utility caps — go crazy! 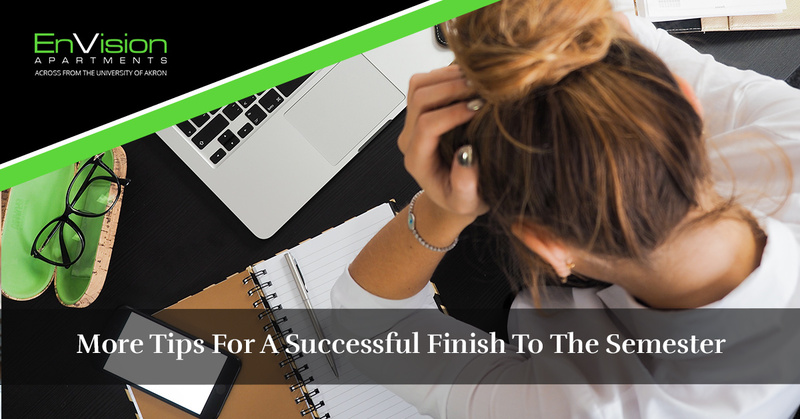 In a follow-up from our first blog post about navigating the rest of the semester, here are some additional tips to help you finish strong. Trying to get through 200 pages of reading in half an hour just isn’t realistic, but reading and taking breaks as you go will be a much better use of your time. Generally speaking, it’s recommended that you take a quick five to ten-minute break for every hour of studying or work that you do. Even if your break involves a short walk around the building, a drink of water from a nearby water fountain, and a handful of trail mix, at least you’re giving your eyes a break from straining over your laptop screen. Even if you prefer to study in isolation, attending a class review session prior to your final exam isn’t a bad way to spend time. Not only are you showing your professor or TA that you care enough about your grade to show up to something that’s optional, but someone else may ask a great question that you hadn’t thought about. In a similar vein, it’s well worth your time to visit your professor or TA’s office hours and get a little one-on-one time in. Last minute studying for an exam is a surefire way to overload your brain with information. Think of your brain as a paper shredder. You can only shred so much paper at any given time, and when you try to stuff too much paper in at once, it simply won’t go in. A slow and controlled approach is much more effective. If you’ve waited too late, just focus on the high-level points of your content and try to get good sleep, stay hydrated, and so forth before your exam. Also, eat a good meal beforehand. We’ll leave the rest up to you. If you or your roommates have any questions about pricing and availability for future semesters, feel free to get in touch with the EnVision Apartments at your convenience!